I could tell within the first 30 minutes of the market open that it was a non-conducive day to trade my style. I’m not just saying that in hindsight… I actually said that out loud and in the chat room. Yet what did I do? I pushed the gas instead of the brakes. Looking at my stats, I traded the most amount of contracts today over any other day. It is data like that which I really do appreciate because what it has shown me is that I tried to recoup my losses instead of accepting a small day at break even or a little red. I pushed it toward the end and I know I did. I’m glad I did because I have now given myself an experience that I will remember as ‘you pushed it like an idiot, and you burned yourself.’ I will not be beating myself up over losers/losses because being strong mentally requires confidence ALWAYS and I will not go back to my dark place of doubting every trade I take. I can do this and I will do this. Last week and this week and probably this upcoming week are here to have me go through how I will react in different situations. I’m going to listen extra well next time the words ‘this market is not conducive’ come out of my mouth. Also, Thinkorswim was placing these phantom orders for me where it would fill a cancelled order. That definitely shook me a bit having to manage those. Hopefully I will not have that problem again. Today was a good day. First trade of the day, end up down $250. I could tell just from the morning’s candles that it was choppy, and getting chopped up was not something I was looking to do. I gave it some time to produce a trend and sure enough it did. I dug myself out of that hole and ended up positive on the day. Another key feature is that I was only 50% correct in my trades, but I finished positive. Kept my losers small enough that my winners washed them out. That’s the key to staying around for the long haul. I think what I’m most proud of is the fact that regardless of any loss I took, I stayed in the moment for the next trade. I wasn’t trading to ‘get back what I lost.’ I was trading because it made sense to. Now I have certainly made some poor trades on my capital account, there is no denying that… but I have also had some stellar days. What I fear the most is not being able to recognize the days that are not conducive to my trading style and that I should not be trading. When I’m on it, I’m on it. I just feel at peace and in sync with what is happening. Maybe that’s it right there. Maybe on days when I’m not feeling the rhythm it’s time to sit on my hands. So yesterday I was busy getting setup to paper trade (as close of a setup as I can without actually using my current capital). Worked out some kinks and hit it full speed today. 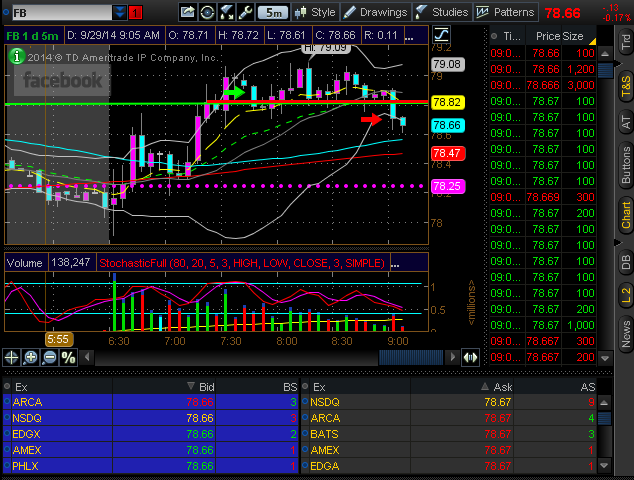 I’m also going to use something called Tradervue to post my trades. Hopefully this will work nicely with the website. Oh yea… and the $SPY + most stocks bled out today. It was awesome. Keep in mind, this month is full on paper trading. I’ll post and share all my trades (both good and bad). 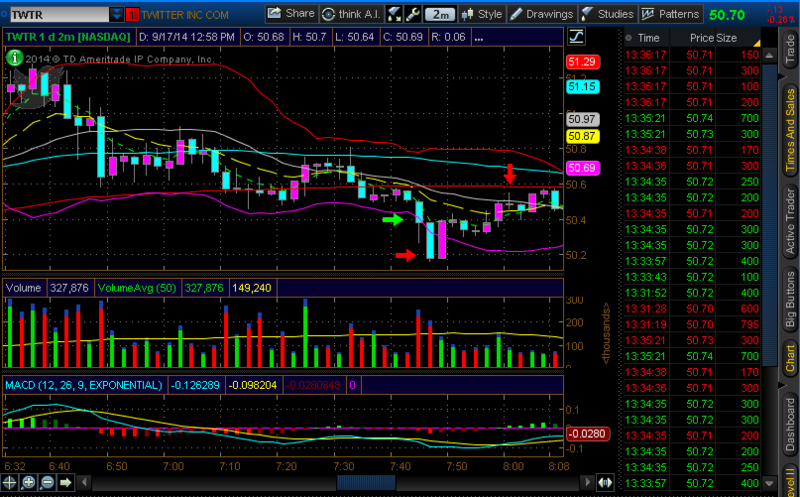 If you click on those trades you can see the times/charts/points at which I scale out. Let me know what you guys think or if you prefer just having screenshots of entries/scaling. The market was making a good move while Facebook was on all time highs so I went long on a pullback. Learned my lesson though… I wanted to enter on a dip to the 9EMA but I was impatient. Could have gotten a much better entry and made a decent profit but instead it turned into a small loss. 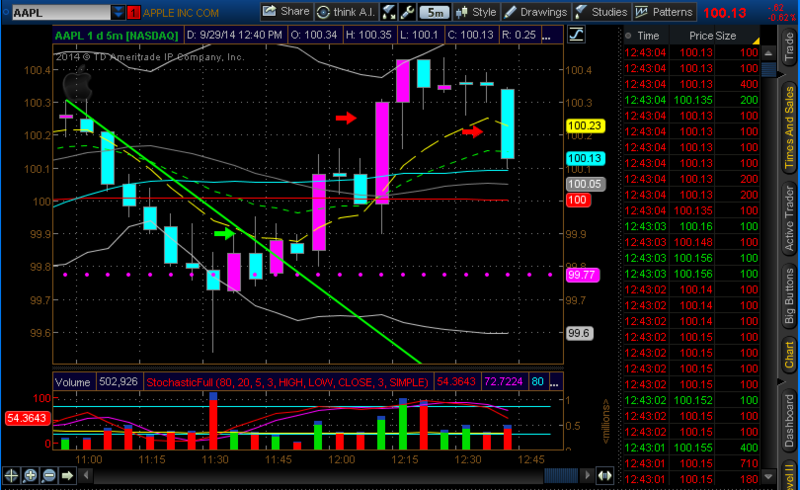 Apple broke its downtrend at the same time the market was turning to the upside so I took a long position. Scaled out and locked in some profit.